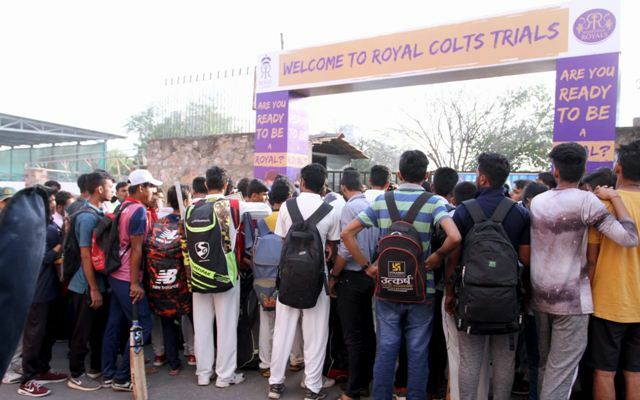 Jaipur, Oct 11, 2018: The trials of the Rajasthan Royals’ Royal Colts kickstarted at Neerja Modi School today. The day started at 07:30 am with kids in batch 1 lined up to wait for their chance patiently. The process started with verification of their age followed by division of candidates according to their specialisation. While the trials were on, what was more interesting to see were the girls standing and watching the trials from a distance who went upto Zubin Bharucha, Head of Cricket, Rajasthan Royals and asked if they could also give trials. That is when Bharucha instantly decided of opening these trials for the women cricket enthusiasts also. The trials will be open from October 13-15 for the female candidates. The candidates who wish to give trials can come at Gate 6 of Neerja Modi School at 7:30 am on all three days from 13th to 15th of October. Through the day, a pool of talent including batsmen, bowlers were put to test by our scouting panel. Day 2 of the trials will begin tomorrow, Oct 12 at 7:30 am at Neerja Modi School. All kids to report at Gate No 6.